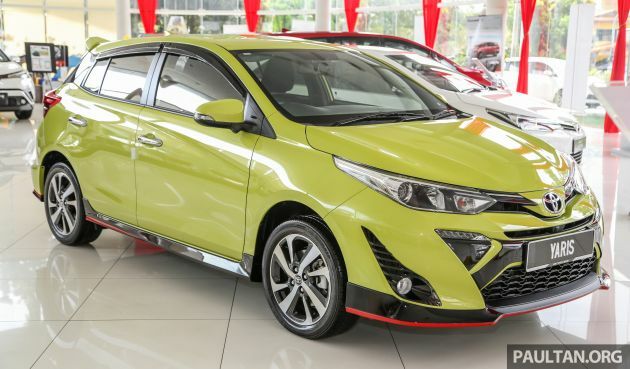 2019 Toyota Yaris 1.5G displayed in PJ - RM84,888 est. Home » Cars » 2019 Toyota Yaris 1.5G displayed in PJ – RM84,888 est. The 2019 Toyota Yaris has yet to make its launch debut here in Malaysia, but it looks like units are beginning to make their way to dealers. This particular example was spotted at the Toyota showroom in Section 19, Petaling Jaya, and we’re bringing you a full gallery of it. Getting into the specifics, the car seen here is the top-spec G variant, which is one of three that will be offered to buyers – the others being the E and base J. For now, we’re being provided estimated pricing (OTR without insurance), with the G going for RM84,888, the E for RM77,888, and the J for RM71,888. Regardless of variant choice, five colours will be made available, including Super White, Silver Metallic, Attitude Black, Red Mica Metallic, and the colour you’re looking at here, Citrus Mica Metallic. In terms of what goes under the bonnet, the Yaris shares the same engine and transmission with the Vios, which is the a 2NR-FE 1.5 litre Dual VVT-i engine (107 PS and 140 Nm), paired to a CVT with seven virtual ratios. Equipment-wise, the Yaris in G guise appears to get projector headlights, 16-inch two-tone alloy wheels (with 195/50 profile tyres) and LED taillights on the exterior. This unit also looks to be fitted with the optional RM2,800 aerokit, which adds on front and rear bumper spoilers, side skirts and a roof spoiler. A cheaper, RM2,450 aerokit is also available, but it comes without the roof spoiler. Moving inside, the Yaris’ dashboard is basically identical to that in the Vios, and features a DVD-AVX infotainment system with a 360-degree camera system, Optitron instrument cluster with a 4.3-inch multi-info display, single-zone automatic climate control, fabric seats, rear USB charging ports and a multifunction steering wheel. Safety kit includes seven airbags, hill-start assist and blind spot monitoring with rear cross traffic alert. These items are again, like what you would find with the Vios. As reported previously, the Yaris’ estimated prices are between RM2,400 to RM5,300 cheaper than the equivalent Vios, which is priced from RM77,200 to RM87,300. Like the Vios, the Yaris will be assembled at UMW Toyota’s new plant in Bukit Raja, Klang, and you can click here to register your interest. UMW Toyota trying to win some Myvi/Alza/Aruz customers? Toyota is clearly the REAL game changing brand! In the same period, Proton sold 785 Iriz. Who’s vomit inspired this colour choice? The God car is here!! Vios hatchback cheap retail price surely dominates over myvi soon. When I see a price tag with many 8s, definitely that is a markup price. No one uses this la. i think so too.. previous gen has the by far the best headlight, bumper, grill, fog lamp, etc etc designs, latest gen is so ‘ BUSY ‘ with all those crannies and holes, triangles, slashes, thus ‘ UGLY ‘. Great car those upgrading from Polo, 208 & A200. No leather seats is questionable decision by UMW Toyota but I recently sat in a 2014/2015 Vios 1.5 G with leather and seats were rock hard. So means no need leather seats la. That RM2.8k kit honestly is ugly! did thing just fell off the ugly tree? The latest spawn from “Beautiful” monster. Fugly apple didn’t fall too far from the fugly family tree. At that prices? DoA just like the predecessor. Will be forgotten soon enough. as usual, no turbo charger and cannot challenge a civic. Ya ya ya, Civic is the best creation by human kind…What’re you smoking today? Honda is for low class ah bengs to impress the low class ah lians. Real high class businessmen buy Toyota vehicles. There’s a reason why the people in the kampong admire you when you roll up in a huge black Toyota. They view you as someone who made it in life. If it was the Corolla I’d understand, but comparing this to the Civic shows your just a baby. Time for a diaper change. Come on la UMW how much does it cost to equip your Vios/Yaris with LED headlamps la? Even low beam LED is better than projectors. stingy dealer always put big fat profit margin first.. Went to see the car up close at the showroom today. Disappointed with what you get (or rather don’t get) with this price. No leather seats, no paddle shifters, no cruise control, and I’m talking about the highest spec. What I do like is you get scuff plates and foot light at no extra costs. But in my opinion, simply not worth its price tag. Since when an offering of Toyota is worth its price? You forget, no hybrid option as well. Pound for pound, Jazz is the better option and if budget does not permits, Iriz is the next best thing. PNB has to distribute enough dividends to contributors who r also affected by the other GLC’s which need gomen bailout into the tune of easily Rm30 Billions. BESIDES PNB,and KWSP …which gomen GLC is doing well,having been plundered by bandits? Now MAS is also insolvent technically..requiring a fire sale or further Rm Billions of cash injection. So,a cheap Toyota in Bolehland is just a myth.Do u understand the meaning of myth ? Myth is when we refuse to repatriate obscene profits back to Japan which caused the high prices. Myth is when we tell Toyota Japan, enough is enough. We have had it with making Japan richer from our hard-earned money and we refuse to pay these high prices anymore. Myth is when Toyota finally realise we are no longer their assured cash cow for their outdated cars. Myth is when they finally give us reasonably specced modern cars at reasonable prices without the cut-throat profit margins back to Japan. This would be a myth worth fighting for. Proton certainly looked very promising now with Dr Li Chunrong. MAS did look promising too then under the helm of Christoph Mueller. The same cant be said of other GLC’s to the likes of Felda, TH and 1Mdb having been plundered by bandits. This site has nothing to do with GLC, MAS, Mueller, Felda, TH, 1mdb or plundering. If you want to talk about PH plundering the country go do your keyboard warrior antics in other sites like lowyat. Here we only talk about automotive. Since when B-segment car get leather seats & cruise control? Please do your research before making such comments and take a look at the Mazda 2, Honda Jazz and Kia Rio. Although not all of these have both features, but at least one of them. Toyota & Nissan cars only their salespipu can like. Mechanical hand brake? Which year are these car from? 2002. That was the year the Vios/Yaris platform was born and it never changed since then. Jazz win hands down! And we are not even talking about the new Jazz which is coming soon. The interior especially looks dated. Why is the price of the car still and ESTIMATE? But jazz have a hybrid version, more fuel efficient than yaris..
coming from a self proclaimed perodua fan boy. I am amazed a comment like this made it past the mods while some other comments critical of the blue-eyed-ex-national-carmaker didn’t make the cut. Previous Post: One-off Tesla Roamer motorhome to debut on April 17 – features pop-up roof, solar panel, bed and toilet!